In Colorado’s San Isabel National Forest, along the eastern base of the majestic Sawatch Range on the west side of the Arkansas Valley, several trails skirt the edge of some of Colorado’s most accessible and scenic mountains. 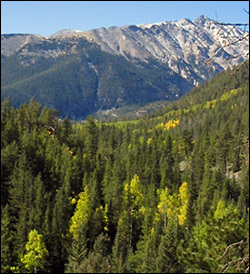 While Buena Vista and Salida attract most visitors to this area, several county roads near the tiny town of Nathrop offer access to hiking in the shadow of 14,000-foot peaks. At the end of September, I ventured to greater Nathrop seeking trails and changing aspen trees. You won’t find Nathrop on anyone’s list of best mountain towns, and it barely qualifies as a “town,” hosting a post office that’s easily missed zooming down U.S. 285. Several large, sprawling cattle ranches dot the area. Starting at the junction of Raspberry Gulch and the Colorado Trail, just off County Road 273, I took the Colorado Trail south on a crisp, late September morning, blessed with a crystal-clear blue sky. A light dusting of snow crowned the high peaks of Mt. Princeton and Mount Antero. The aspen trees in this area were morphing into their autumn hues, streaking the mountainsides with bands of gold, not quite at their peak brilliance. The sandy trail was fairly flat in this area, gently rising and offering views across the Arkansas Valley to the east. Gradually, the giant peaks to the west begin to reveal themselves along the trail, dominating the landscape to the west. The trail follows the rolling topography, dipping into gulches, then climbing gently to the top of ridges. Given the drenching that the Colorado Front Range received in September, this trail’s condition was very good. Pines soon yielded to spruce as the understory, while sparse, was very green for this time of year. About one hour into the trek, the trail steadily continued its climb through a rocky, sandy gulley. A junction soon appeared, marking Little Brown Creek Trail #1430 straight ahead and the Colorado Trail to the left. The Little Brown Creek Trail led into a backcountry area of San Isabel National Forest. 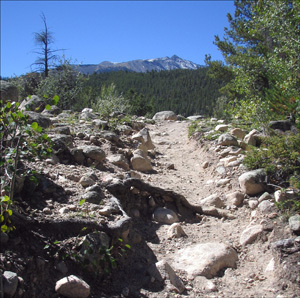 Following the Colorado Trail, the trail sliced through rocky terrain. A short distance later, the sound of a Little Brown Creek trickled up to the trail. A beaver pond on the right soon appeared. Markings of equestrians dotted he trail as it dipped down into a dry gully. Rising to an overlook, the Arkansas Valley appeared in the distance. At this point, another junction appeared and I decided to deviate from the Colorado Trail and follow the valley and creek east, hoping to discover golden aspens. The trail soon tracked due east, away from the creek. 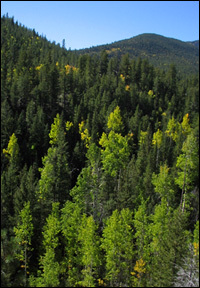 The mixed spruce/pine forest was cast in high contrast due to the bright late-September light. The trail, twisting and turning, again reached a point affording views of the valley to the south and east and, in the distance, U.S. 285 leading down toward Salida. The trail eventually switchbacked down to the Little Brown Creek trailhead. Turning back, the 1.5 miles from the trailhead to the junction of the Colorado Trail was a steady but easy uphill climb. The varied topography of this serene trail, moving up and down along the base of stately mountains, makes this route truly pleasurable, merging peaks, forest and valley, with the mountainsides laced with shades of gold and yellow. While equestrians, hikers and mountain bikers share portions of these trails, during my visits to this area, the trails were delightfully empty.